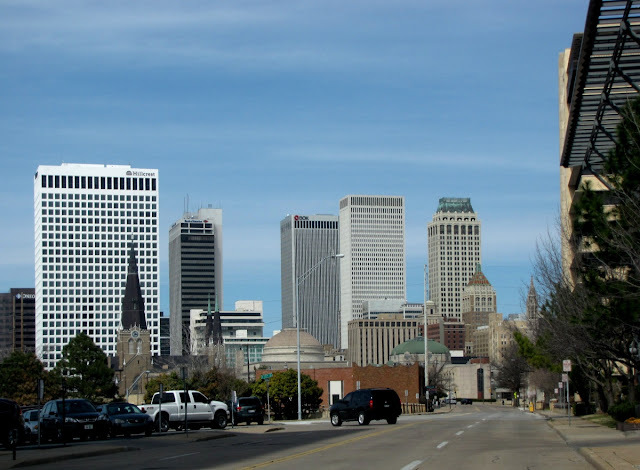 The view of downtown Tulsa looking north from about 13th and South Boulder Avenue. Interesting view of the city! Very nicely captured. It's interesting how one can chart the growth of a city by looking at the skyline. Tulsa has it's incredible collection of Art Deco. Then there appeared to be a long period without much new construction in the downtown area. Finally, in the late mid-sixties to mid-seventies new buildings popped up everywhere. But one can also see the relative sameness of the "International Style" architecture when compared to the variety found in Art Deco. Have a blessed week-end. Tulsa has a nice skyline. Great pic! Yogi's summed up my thoughts on this very nicely.